Many users face the issue of no audio and sound in their Windows 10 system. This problem often occurs after you have upgraded the system from its previous version to a new one. If you are facing this kind of issue, you need not panic. Audio or sound issues are easy to solve with our guide. We have given seven simple fixes from which you can use anyone that works for your system. In the right bottom corner of the desktop, you can find the icon for sound. 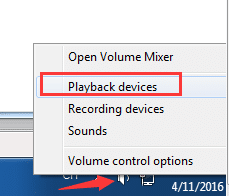 Right click on it and choose Playback devices in the window that opens. Check whether there is a tick in green color against the speakers under the Playback tab. This green colored tick denotes the speakers remain as the primary default device for audio playback. 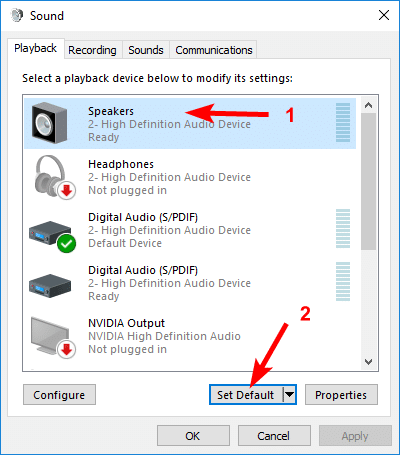 If the speakers are not set as default, you have to click the speakers and choose Set Default option and press the OK option. Test whether the sound issue has resolved. 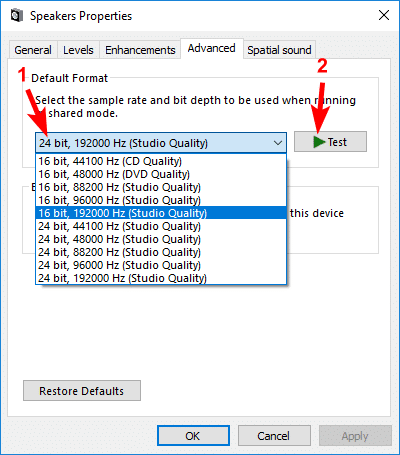 If the sound issue persists even after setting speakers as the default device for playback, you need to test with different audio formats. Click on ‘Speakers,’ and then on ‘Properties’ option. Choose ‘Advanced tab’ and in Default Format section, choose another bit depth and sample rate and click on Test. Keep repeating this method until you get a format which solves the issue. Click on OK option. If not, move on to our next solution. Press the Windows key and the X key simultaneously. This will open the menu for quick access. Expand the Sound, game and video controllers present under Device Manager. Use right click on the sound card. Choose the Uninstall option. 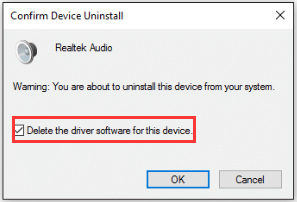 If you are prompted to confirm the uninstall command, check the box with ‘Delete the driver software for this device’ and choose OK.
Now restart the computer to find out whether the sound issue is resolved. If this does not rectify the problem, move on to our next step. 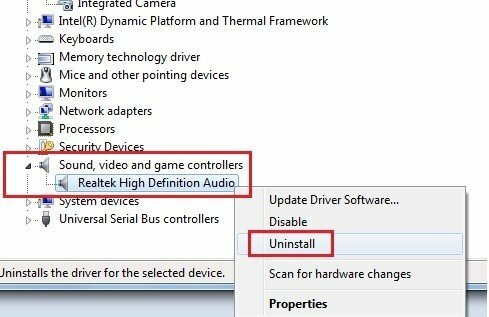 If experimenting with different sound formats and uninstalling your audio driver didn’t bring back your sound in Windows 10, it’s likely that you’re using the wrong audio driver. Using an incompatible audio driver may also cause the issue. You can update the driver manually or by automatic method. Visit the manufacturer’s official website and find the recent and appropriate driver for the sound card in your system and the Windows 10 variant you have. You can also use software like ‘Driver Easy’ to update the driver. This tool will identify your system and choose the right driver for the Windows 10 variant and sound card you possess and install the driver on your system correctly. See Also: Windows Update Stuck? Here Is What You Need To Do! Press both R and Windows key simultaneously and type Control in the search box. Now press Enter key. Under the Large Icons choose the Sound option. Under playback tab in the sound option, choose default device and right click on it. Choose Properties in the drop-down menu that appears. Choose Enhancement tab and tick the ‘Disable all sound effects’ tab present. Check whether the sound has returned. If the sound issue persists, choose to cancel in this option and repeat steps 2 and 3 with the other default device and try again. Click on ‘Start’ menu and type ‘Run’ in the search box. You will find the ‘Run’ dialog box displayed on the desktop. In the Run box, type devmgmt.msc and click on OK to open the Device Manager. 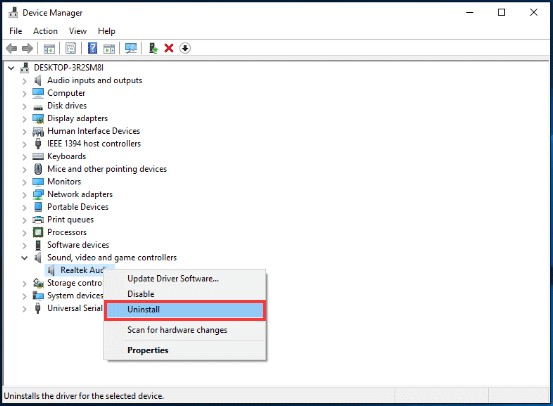 Expand the ‘sound, video and game controllers’ under device manager. 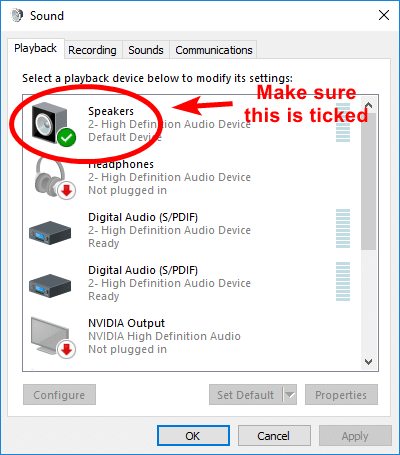 Use the right-click option on Realtek sound card. 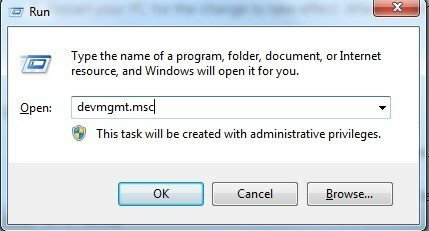 You will see a pop window with a context menu. Choose the Uninstall option. Check the box beside, ‘Delete driver software for this device’ and choose OK.
To make the changes effective, you have to reboot the system. Once the system restarts, it will reinstall the Realtek driver. In sound icon present in the taskbar, use right-click and choose ‘Troubleshoot sound problems’ option from sound icon menu. The troubleshooter feature will be activated. It will scan the audio automatically and identify any errors present. If the troubleshooter identifies a problem, it will send you a notification or try resolving it automatically if possible. If it does not fix the issue automatically, it will inform you about the problem in detail and help you follow the steps to resolve it on your own. If it does not find any visible fault, it will just say that the device did not identify any issues and provide you with other options. If the troubleshooter indicated an unplugged audio device, you have to check the connection between speakers and the physical link. You need to verify the link for proper connection. Press Windows key and R key to open the Run feature. Type the letters, “service.msc” to help launch the ‘Services’ option. Select Windows Audio service and ensure the status of the service as ‘Running.’ You can also right-click on the ‘service’ option and use ‘Start’ feature from the menu for initiating the service. You have to restart the system to fix any issues. You need to use right click of the mouse on the service and choose ‘Stop’ for disabling the service. Now right click again and choose ‘Start’ option to make the service function. We have provided you with seven different solutions for your Windows 10 system. You will find that any one of the solutions may work out for you.